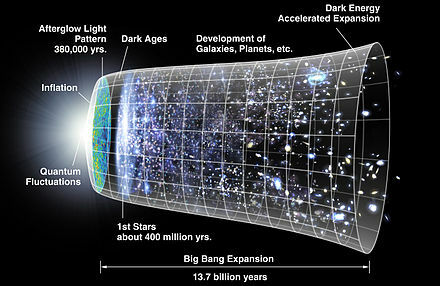 Cosmology is the study of the Universe as a whole and its history since the beginning. Our understanding of this history is undergoing a revolution with fields as diverse as high energy physics and astronomy converging in both theory and experiment. Further, cosmological discoveries over the past two decades have and a profound impact on both astronomy and Physics. We have found that the inflation of the universe is being accelerated by a mysterious "dark energy" and that much of the matter of the universe is also "dark". Scientists in the Institute and elsewhere are working hard on both theories and experiments which will shed light on what particles make up the "dark matter". The origin of Structure in the Universe - such as galaxies and clusters is believed to have happened through sub-atomic quantum fluctuations, whose ripples we see as tiny fluctuations in the temperature of the cosmic microwave background across the sky. These and other discoveries show that physics at the smallest scale - interactions of Quarks and Leptons - is intimately connected with the largest scale - the constitution and birth of the cosmos itself.